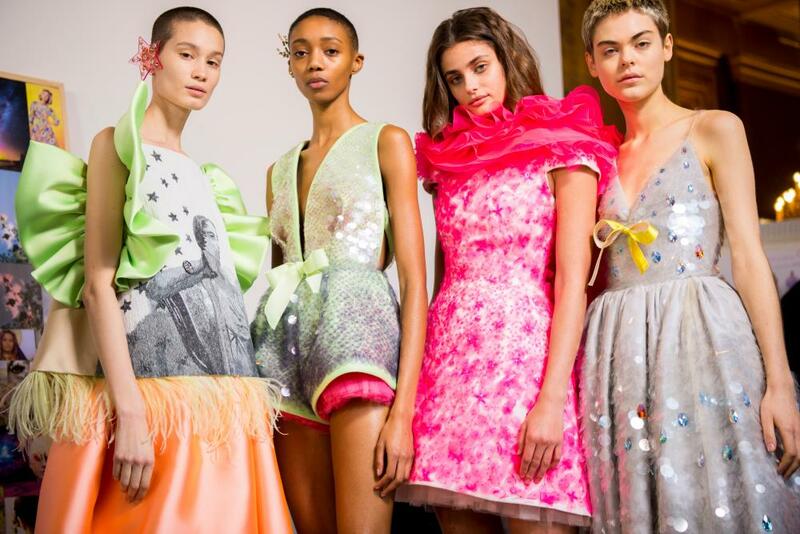 The gilets jaunes protests of January may have threatened to derail couture fashion week by disrupting deliveries and blocking access to studios, but designers beat the odds to deliver another show-stopping season, honouring their hard-won spot on the hallowed schedule. 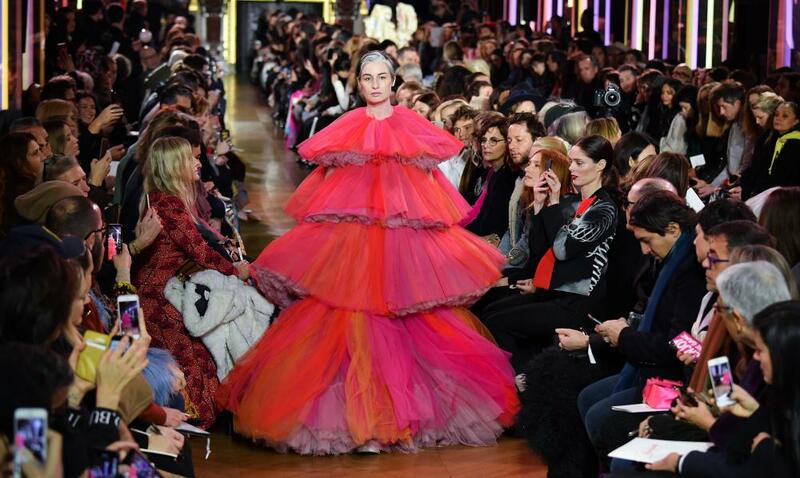 From Valentino reducing the audience to tears to Viktor & Rolf’s meme-inducing dresses, this season delivered headlines and viral crazes on social media, making sure there was something for everyone to enjoy. 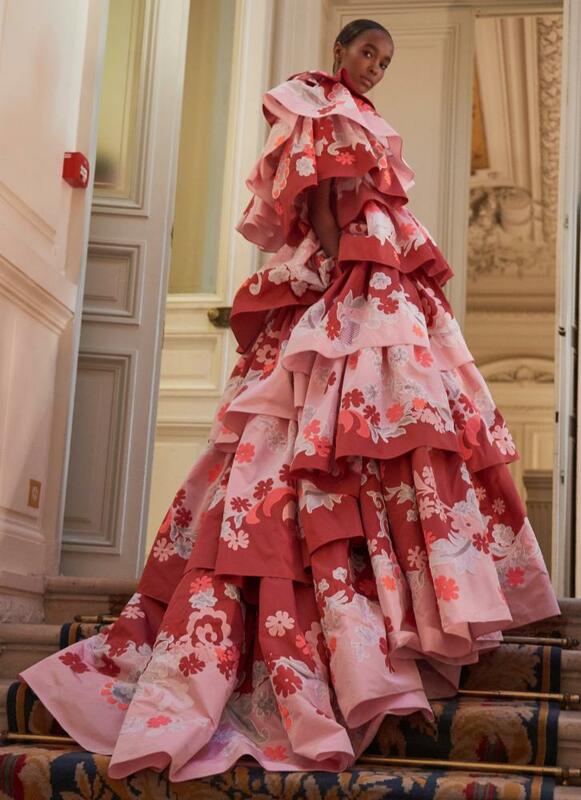 The Chanel couture show may have made headlines for the absence of Karl Lagerfeld (he was tired, said the house, so his long-time right-hand woman Virginie Viard took the bow with the bride instead), but there was an abundance of style notes to be made from the runway. 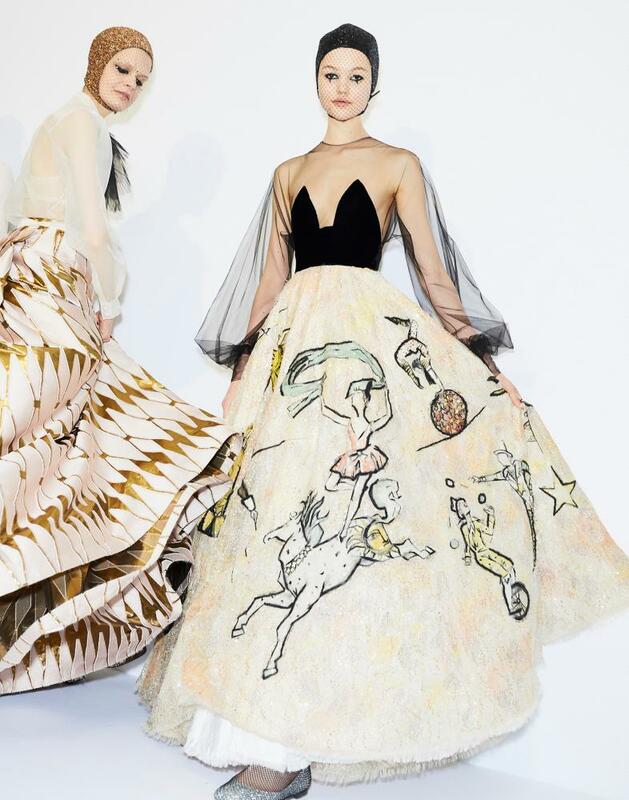 Staged at Chanel’s regular haunt – the Grand Palais – against an Italianate villa imagined through a trompe l’oeil cyclorama, it featured models meandering around the orange trees in impeccably tailored monochrome skirt suits with kick-flare hems, exquisite puff-ball dresses, and appliquéd gowns with tulle shoulders that splayed out like fans. A tiered lace dress at Chanel. 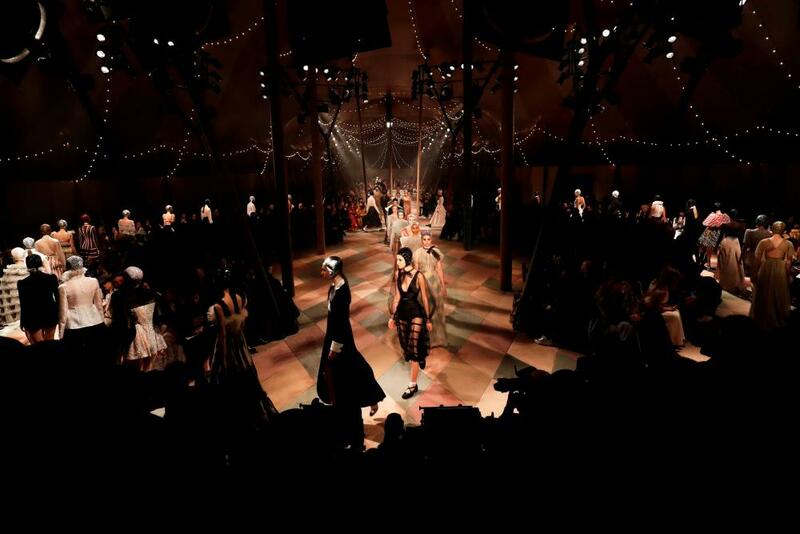 “In a circus parade, it is not just about being beautiful – it is about being proud, about being strong, about being bold and having fun.” So said Christian Dior’s creative director, Maria Grazia Chiuri, backstage before the show, making a clear comparison between the circus stimuli she adopted for this show and the tribe she has sought to create since she was appointed at the house. Chiuri’s collections have been about female empowerment from the get-go and this outing was no different. 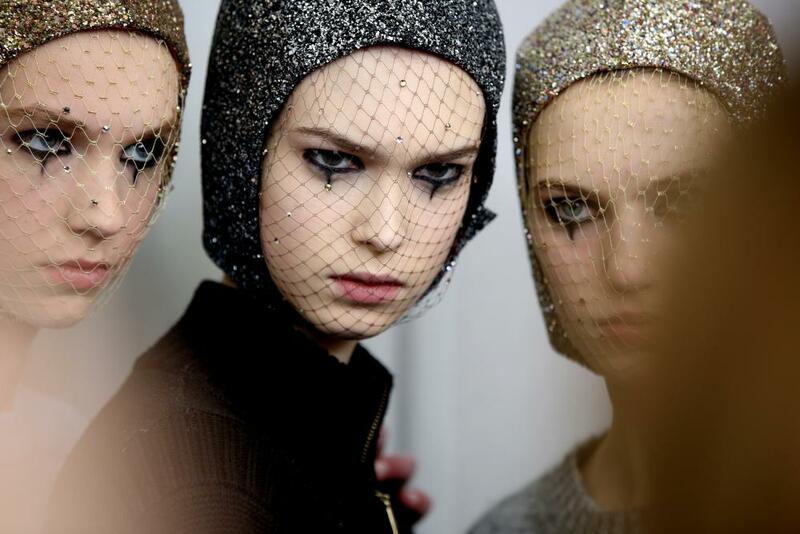 Glittery skullcaps at Christian Dior. As befitted the circus staging (the London-based Mimbre theatre group performing as the models made their entrance), the palette was playful. Several silhouettes riffed on the larger-than-life look of a classic clown, all candy-stripes, ruffle collars, big bow-ties and balloon sleeves. Chiuri’s signature embellished floor-length gowns, meanwhile, gave balance to the bolder pieces, emanating a quiet confidence. It was a class act. 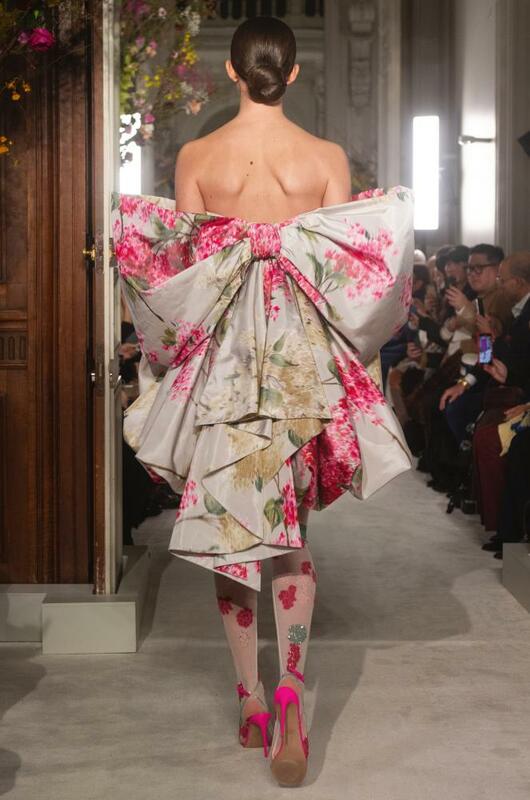 Acrobats on the runway during the Christian Dior show. 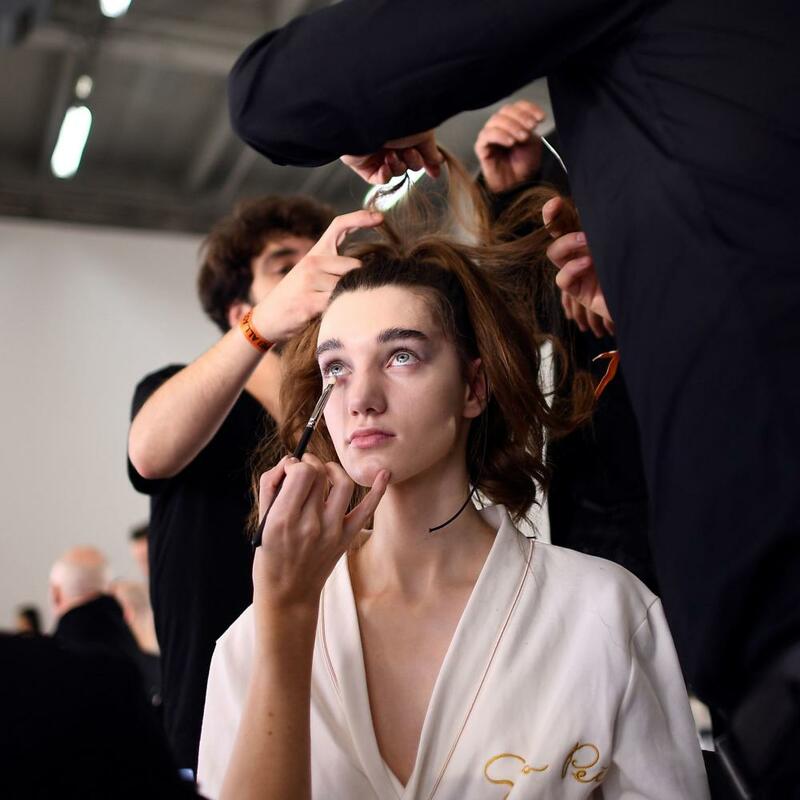 Eyeliner and mesh face masks: backstage at Christian Dior. Kaia Gerber in a jumbo pearl headband and a white lace dress at Givenchy. Hiandra Martinez in a red rubber bodysuit under a black dress and Sarah Dahl in a feathered look. As a result, asymmetric tuxedo jackets were worn with skinny leggings; a sporty racer-style top became a sweeping gown complete with a clean-lined cape; and models with large, squishy backpacks edged with angel wings streamed into the white box of a room that took four months to design and five days to install. In other words, a clean slate. Lines were sculpted yet structural, pitting strength against fragility and creating the most potent of couture juxtapositions. 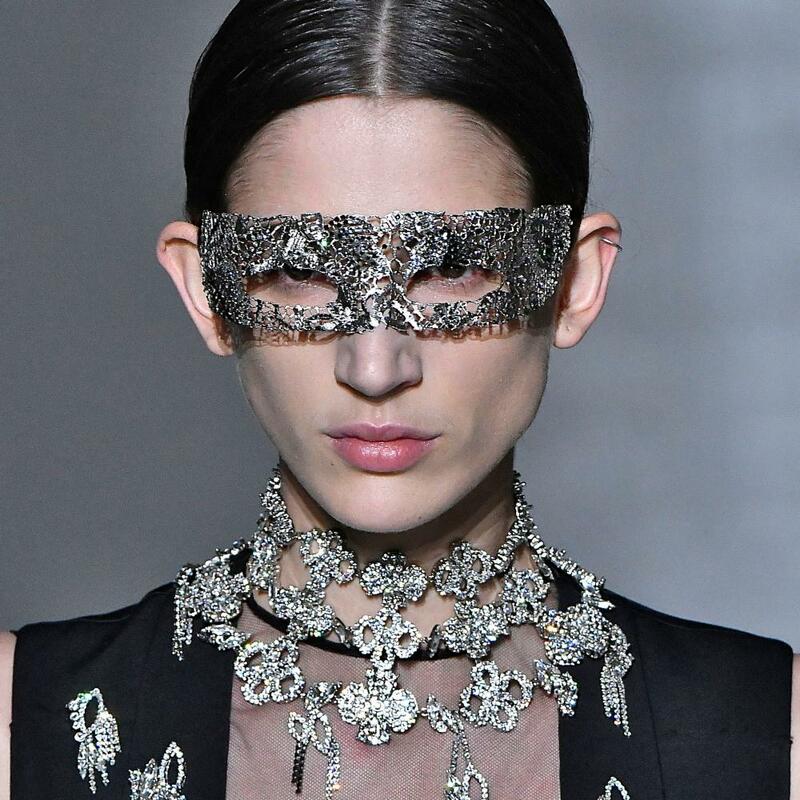 The eyes have it: masks and silver glitter makeup at Givenchy. 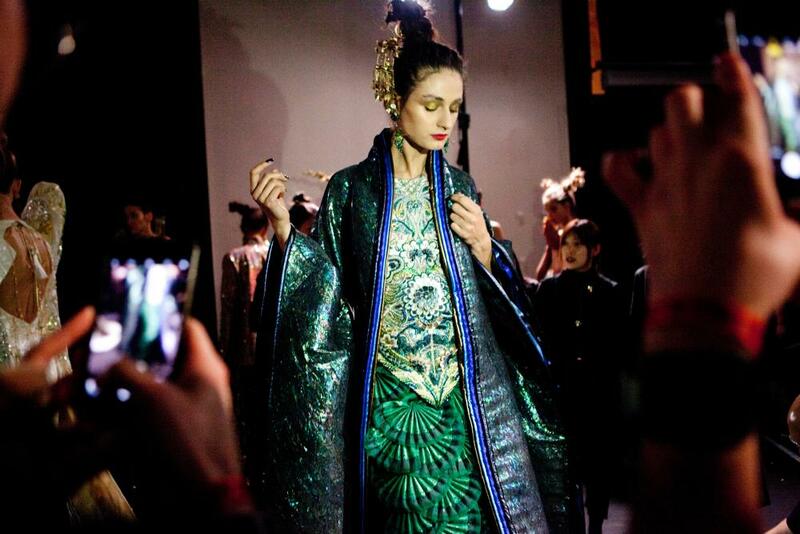 Guo Pei mined her Chinese heritage for her latest couture outing. Calling it East Palace, she brought the Hall of Supreme Harmony in Beijing’s Forbidden City to the heart of Paris, recreating it in the vast underbelly of the Palais de Tokyo. 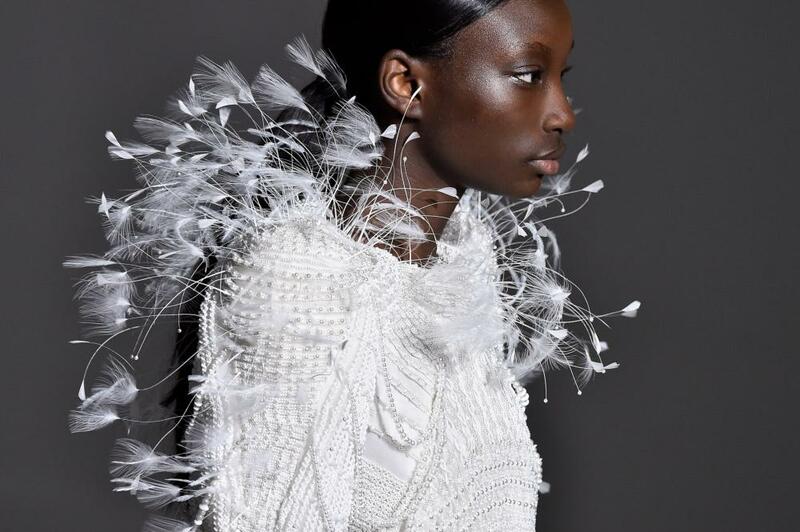 Taking her cue from the architecture of ancient Chinese palaces, her designs appeared stoic and structured, all the time with a delicate celestial magnificence. Accordingly, she bestowed a ceremonial atmosphere on proceedings: models glided by slowly in richly embroidered silk gowns in an opulent palette of golds, molten silver, ruby reds and sapphire blue. Guo Pei is one of China’s most renowned couturiers. 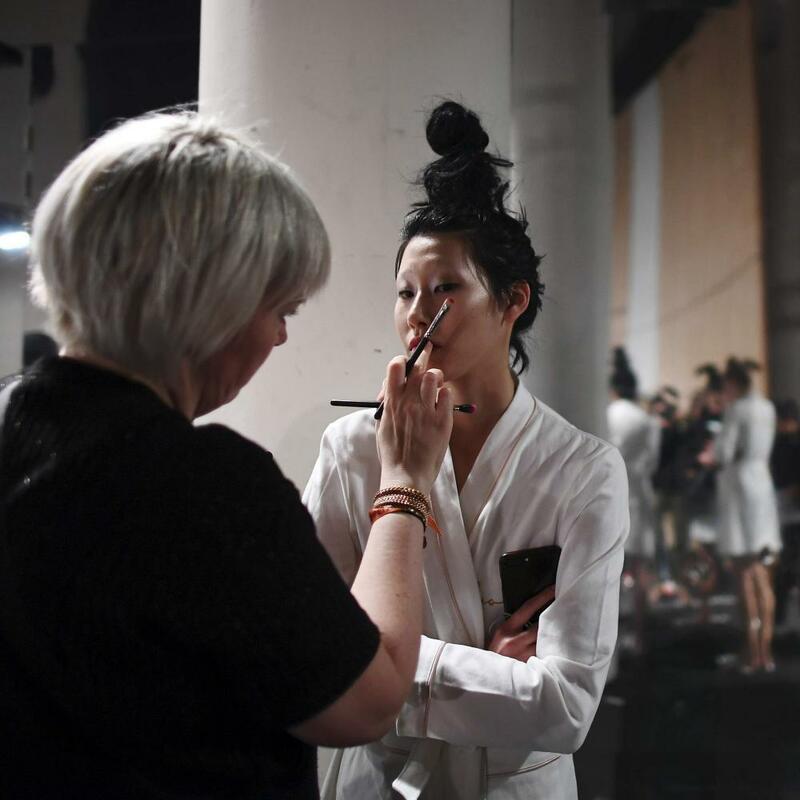 Guo Pei at work backstage. 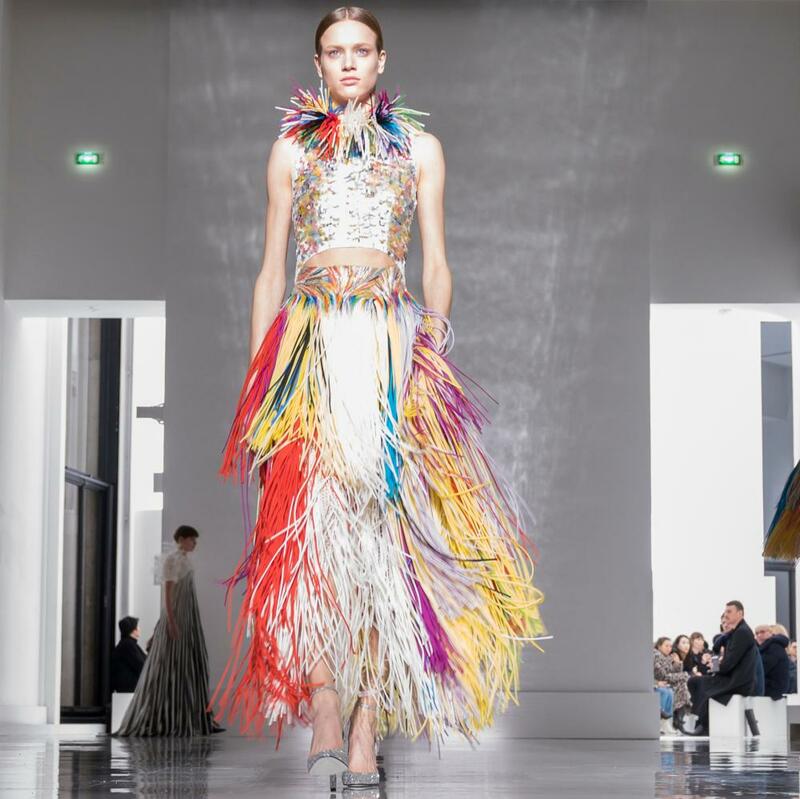 She is one of China’s most renowned couturiers and has been exhibiting in Paris since 2015. Models have their makeup done before the Guo Pei show. 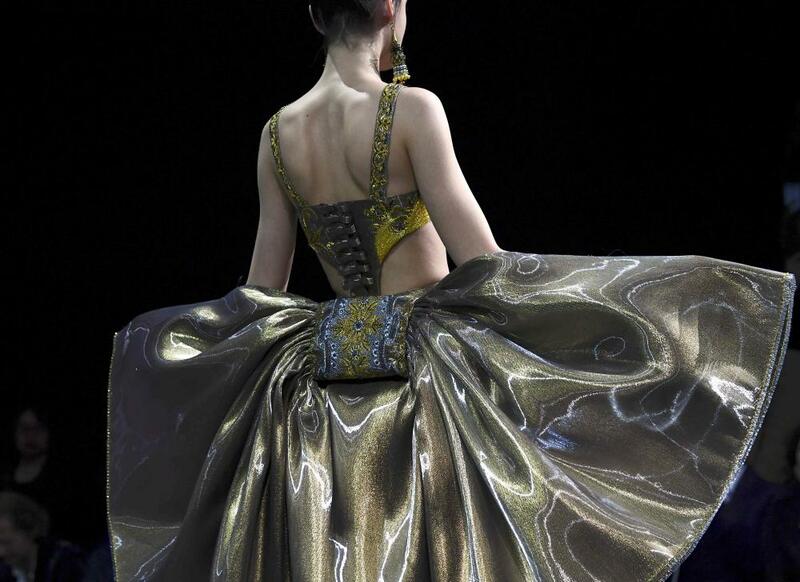 Guo Pei mined her Chinese heritage for the show. 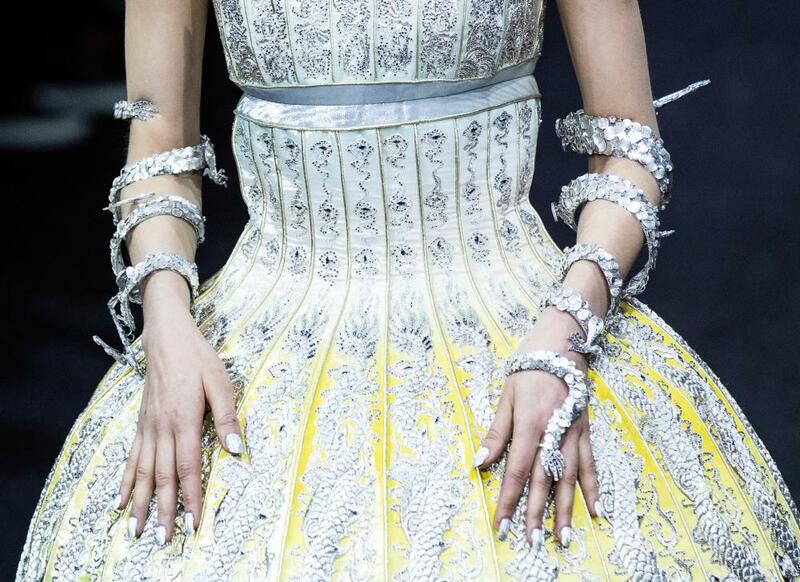 Detail of Guo Pei creations. 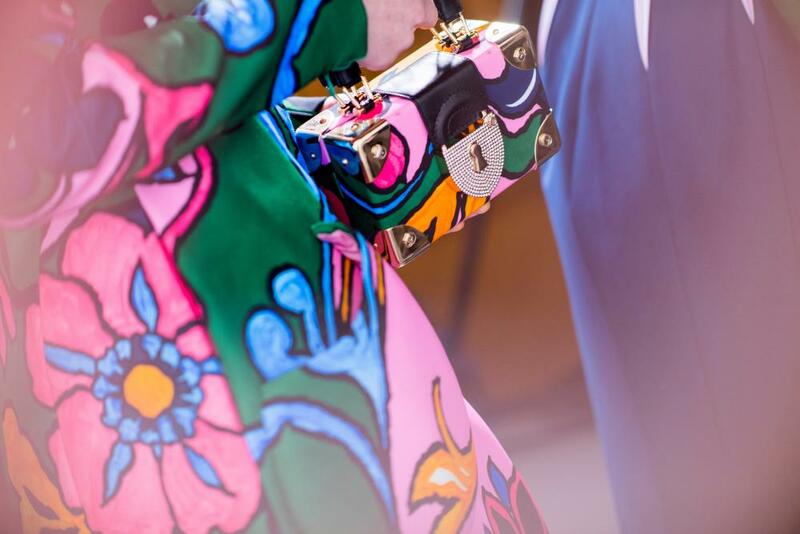 Much like Clare Waight Keller at Dior, designer Tamara Ralph was also in the mood to have fun this season. 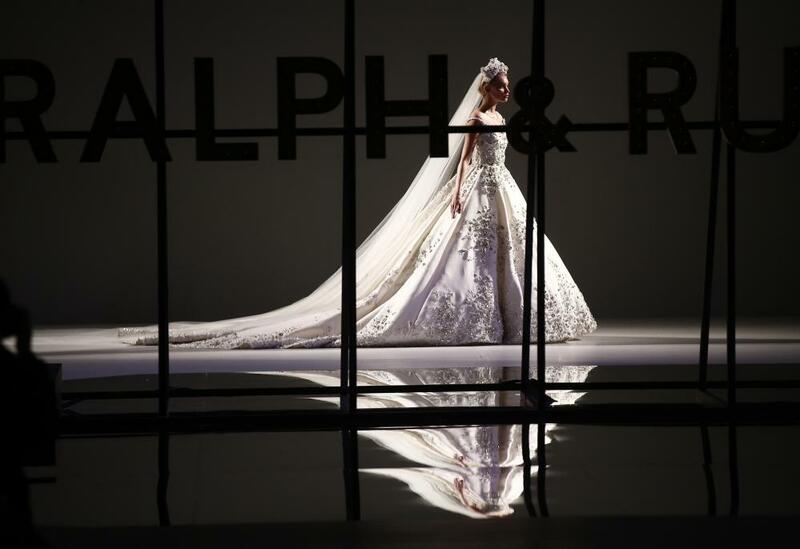 Drawing inspiration from María Félix for the British couture house’s latest outing – who Ralph described as “the most famous Mexican diva of all time” – she steered her delicate designs down a lavish and extravagant path. Bright and bold from the offset, fuchsia pinks and the grassiest of greens were cut into power-shouldered and beaded suits; bandeau dresses with sweetheart necklines came with all-over tassels; black leather gloves were worn with intricately embellished bodices and wide-brimmed hats; and iridescent fringing made several looks perfect for a spin on any diva-approved dance floor. Models backstage at Ralph & Russo. More hats at Ralph & Russo. Enter the wonderful world of Maison Schiaparelli, home of the most wondrous and idiosyncratic archive, which the creative director Bertrand Guyon continues to mine with aplomb. 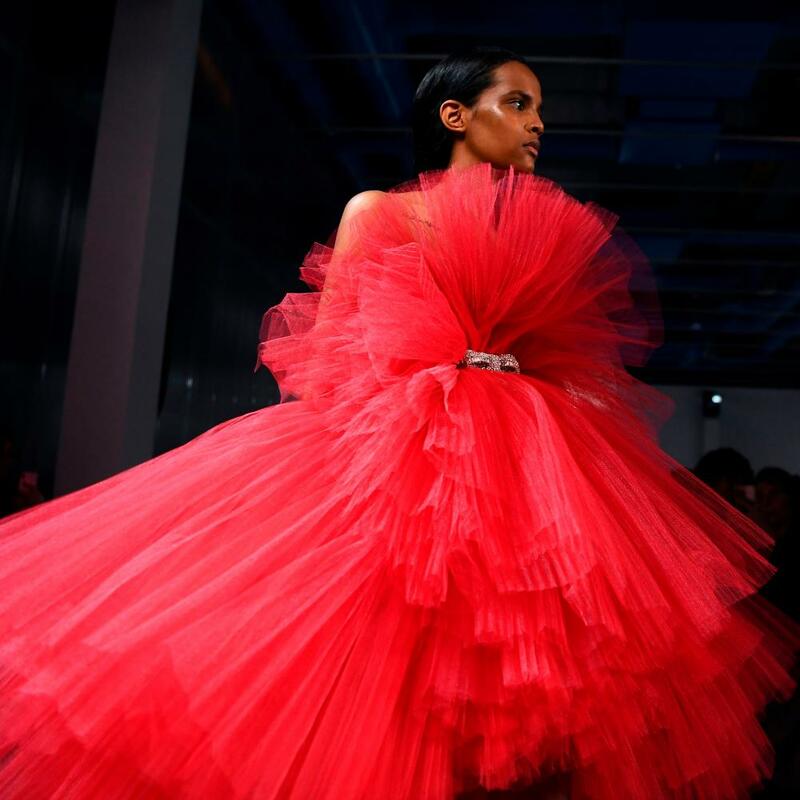 While an eight-months-pregnant Erin O’Connor closed the show and dominated the subsequent headlines in a spectacular sunset-orange, hot-pink and tomato-red tiered tulle gown, the galactic-inspired looks that came before her were as noteworthy. 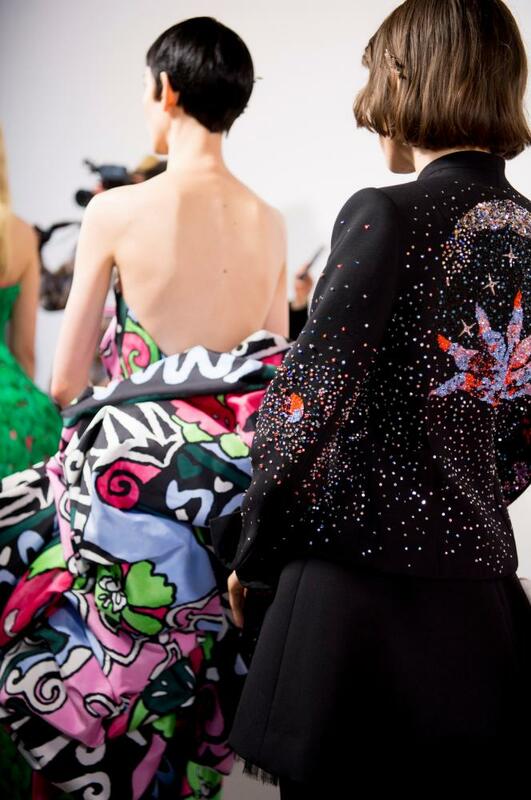 The theme appeared on skirts featuring diamanté-embellished clusters and star-fastened capes; as a rocket taking off past a waistline; and in a zodiac-constellation motif. 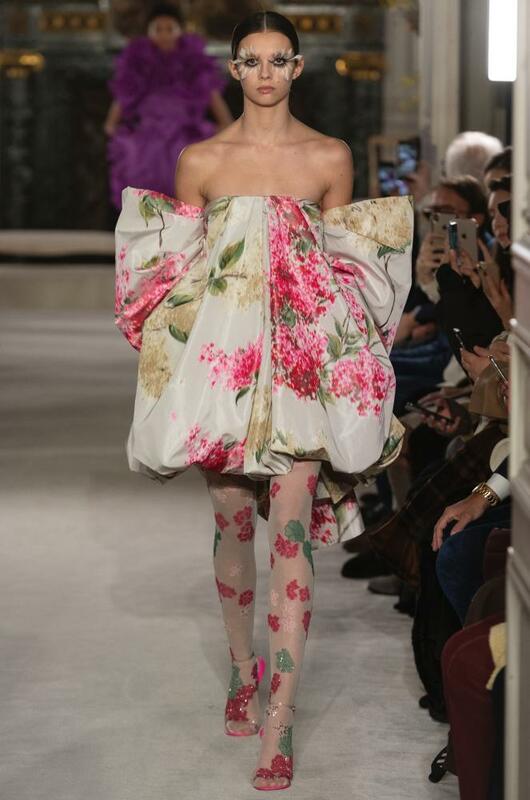 Back down on Earth, florals were in bloom across the show, while the most beloved trimming of couture designers – the ostrich feather – contributed appropriate levels of frou to the atelier’s flou. A galactic look at Schiaparelli. 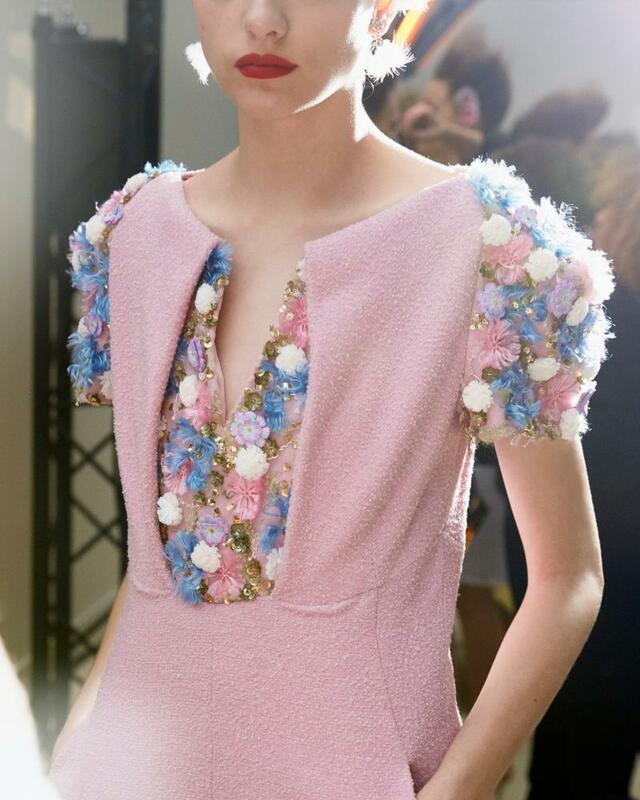 A model backstage at Schiaparelli. Models backstage at the show. Bertrand Guyon, Schiaparelli’s design director, at work backstage. Bertrand Guyon, Schiaparelli’s design director, at work. It was the show that brought the front row to tears and cemented Pierpaolo Piccioli’s status as a master couturier. “For me, it’s about more than clothes,” he said backstage, which is always a good place to start when it comes to couture. These are creations that far exceed the emotional expectations of mere garments – and the audience reaction to this outing confirmed it. Part of the Valentino collection. The same dress from the back. 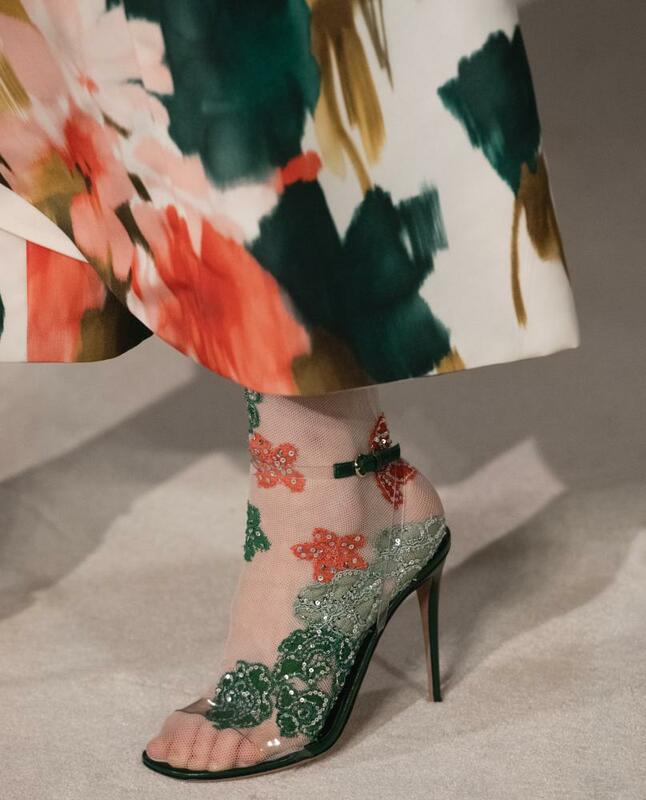 Shoe and dress hem detail at Valentino. 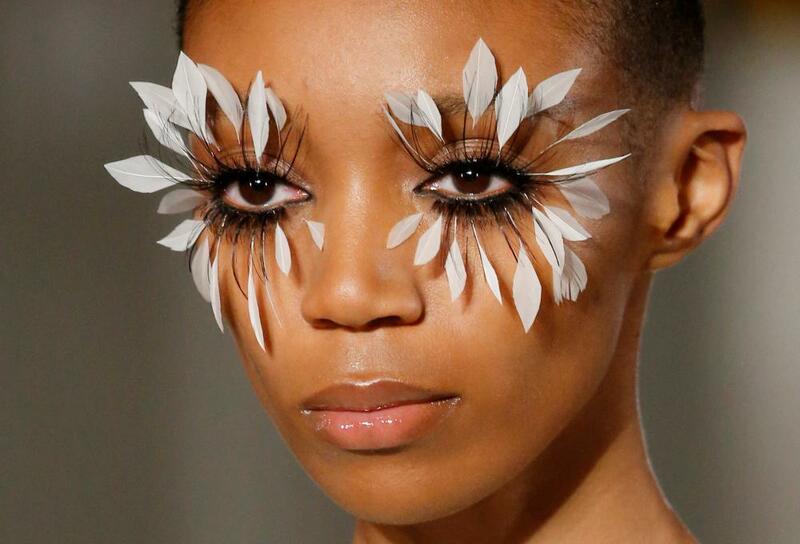 The collection was a colour explosion, rapturous in salmon pink, spearmint, royal blue, regal purple and, of course, Valentino red while all eyes were on, well, the eyes, thanks to makeup artist Pat McGrath’s sensational feathered eyes. Naomi Campbell appeared in a sheer and tiered ballgown to close the show. Afterwards, she congratulated Piccioli on Instagram for “a historical moment, done in such an elegant manner”, adding that she was “blessed to be part of such an incredible, spellbinding moment”. A great of his generation, Giambattista Valli looked to the greatness of Yves Saint Laurent for inspiration this season – specifically a 1977 Helmut Newton photograph of models resplendent in his salon. A lifelong fan of the late couturier, Valli paid tribute with decadently beaded cocktail dresses complete with an asymmetric flourish and the fezs worn by every model. A tale of two halves, hemlines ranged from thigh-skimming to floor-sweeping, while gowns got an update via stomping cowboy boots. Models backstage at Giambattista Valli. 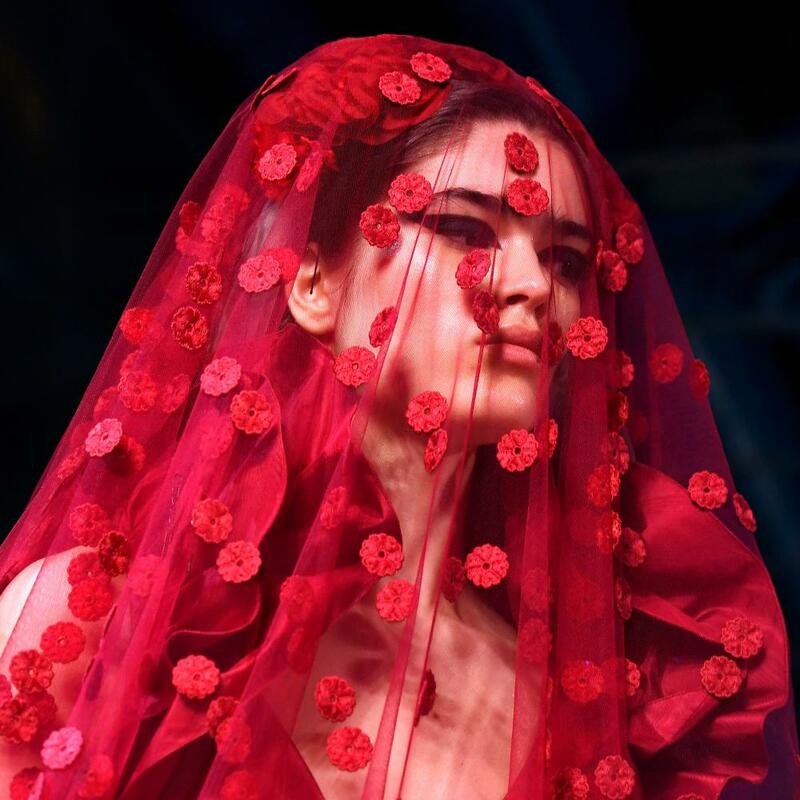 Red: an embroidered veil and a tulle belted dress at Giambattista Valli. Pink tulle and black feathers and bows. 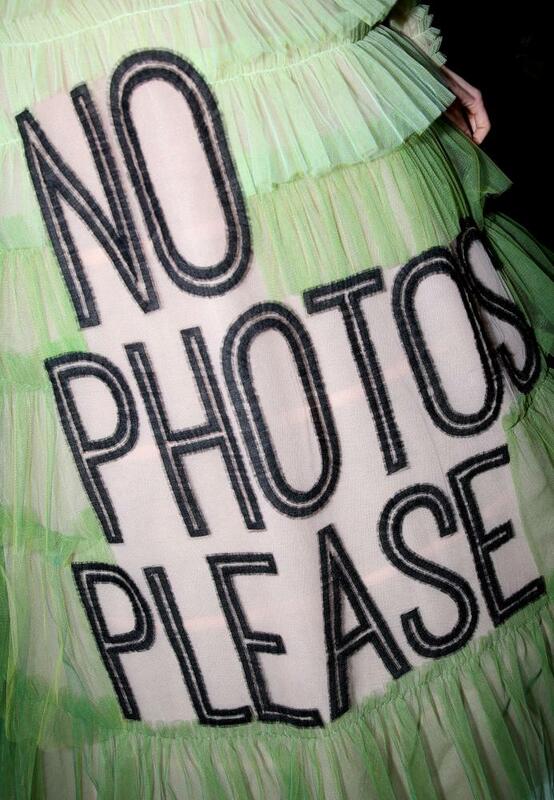 It was the collection that launched a thousand memes: “No photos please”, “I’m not shy, I just don’t like you” and “Sorry I’m late, I didn’t want to come”. 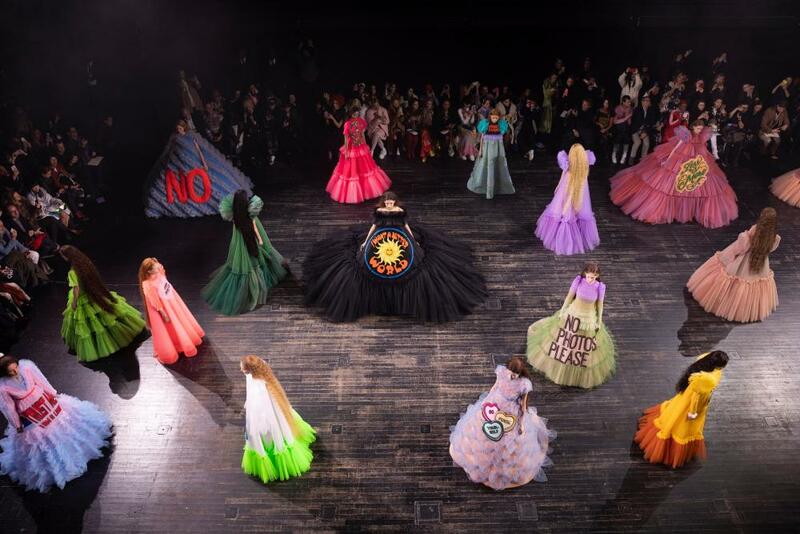 Viktor Horsting and Rolf Snoeren’s sloganed gowns may look incongurous when pitted side by side with the splendour and refinement associated with couture, but it captured the imagination of the internet at large (everyone’s head, from Anna Wintour to Fyre Festival’s Billy McFarland, has been superimposed on one of these dresses). The wording certainly gave a new relevance to the sartorial genre, but that stands up only if the technique is top notch, too – and it was. The lengths of tulle and silk were pinned with the perfection demanded from a spot on the exclusive haute couture schedule. 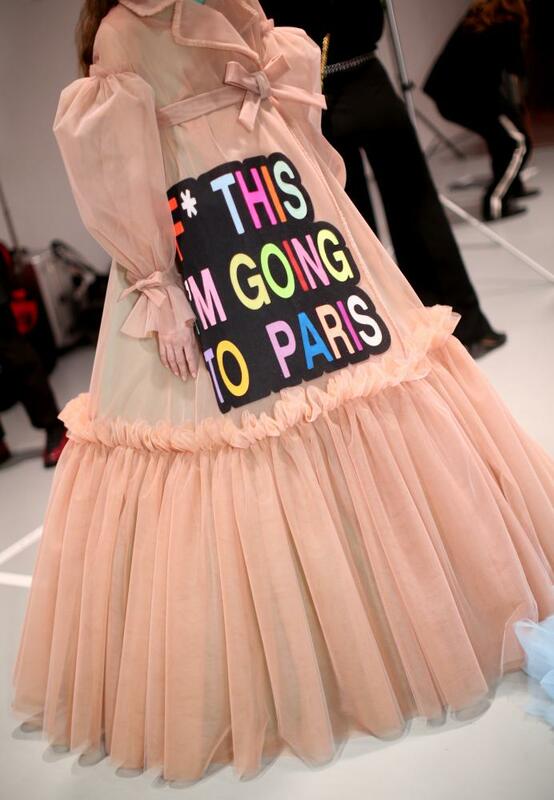 Appliqued slogan dresses backstage at the Viktor & Rolf show.